We think of home health care and or hospice care, whenever we have an ailing senior parent at home. Both of these services can be provided at home; however, they are distinct in their own ways. Advancing age brings along several ailments and challenges for our elderly loved ones. Helping them navigate through the journey with ease, dignity and comfort become our prime responsibility as caregivers. Home health care services are for elderly patients who are suffering from an illness or injuries. It provides rehabilitative services to the elderly patients suffering from chronic illnesses. Restorative treatment is the basic approach. And provide various services through skilled care. This includes a variety of services. The elderly patients who receive home health care services are usually homebound. Elderly patients that need the above mentioned skilled services can receive home health care services. These services help you get better to maintain your own independence and become self-sufficient. Terminal illness is never easy. Hospice care gives supportive care to your loved ones final phase of life. Furthermore, it focuses on comfort care. The goal is to keep your loved one free from pain, so they can live each day as full as possible. The financial expenses incurred in hospice care are fully covered by most of the insurance plans as well as HMOs. The trend is that many patients consider opting for hospice care, only during their last few days. But, ideally one should make use of hospice care in their last few months. To reduce the suffering associated with the agony of symptoms and other disabilities. The hospice care team provides coaching to the caregivers about the type of care required for the patient. Furthermore, the team also provides respite care. When the caregiver needs a break in between care. The duration of the respite care would range from a few hours to several weeks. Home health care services are for as long as the patient does not become independent enough to carry on with his/her activities. The duration is basically decided, based on the goals of care. As far as hospice care, the services are for a period of 6 months, which includes unlimited visits to the care team. The duration can be extended, depending on the condition of the patient. A member of the hospice care team regularly visits the patient. 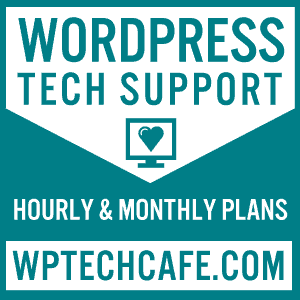 And a 24×7 support is available to them and their family members as well as the caregivers. Any form of emergency is attended to provide medical, spiritual or emotional support. 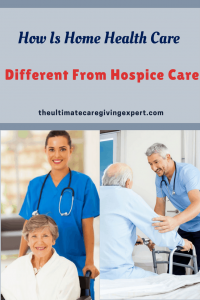 Home Health and Hospice both offer comprehensive care in the convenience of home, but they differ in the objective of the care. 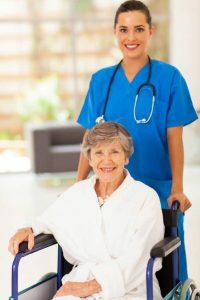 Home health care strictly helps with rehabilitation and medication management in order to improve the patient’s medical condition. Hospice focuses on quality of life for the terminally ill patient and the patient’s family. You can start by talking to your local case manager at the hospital to find out about both services. Hopefully, the above information is a good starting point and if you need more information. Please feel free to contact me for further answers. Also, check out this post on how to pay for caregiving.